September 5, 1931 – The general manager of the Union Station Company, O. H. Frick, announces that work will soon begin on a $2,000,000 powerhouse that will supply heat to the new post office building, Union Station, and other railroad property along the river. The new structure will sit midway between Taylor Street and Roosevelt Road on the west bank of the river. 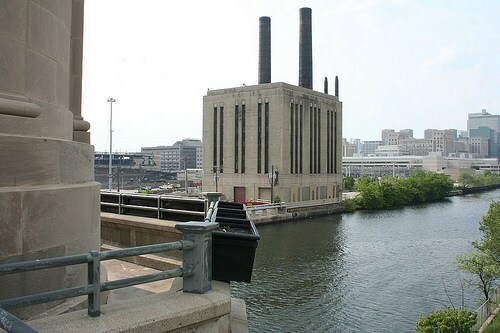 The 14,375 in the new building is necessary because the present Union Station heating plant sits on the site of the new post office, currently under construction. Graham, Anderson, Probst & White, the same architectural firm that designed Union Station and the new post office, will also design he power house. The specifications for the new structure are impressive, according to Frick. He says, “The first unit will have four 1,600 horse power boilers, normal rating, with a maximum rating of 4,000 horse power each. Its capacity will be 16,000 horse power. The maximum length of the distributing system will be about one mile and will use both overhead and underground pipe systems, thoroughly insulated to reduce condensation losses.” The Union Station Company, jointly owned by the Pennsylvania, Burlington, and Milwaukee railroads, projects the cost of the powerhouse at $2,000,000.